BACKGROUND: Vitamin D plays a role in protecting against chronic degenerative diseases. 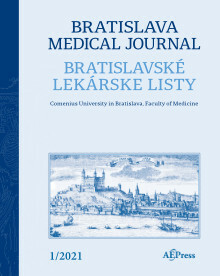 Slovak adults present one of the highest cardiovascular mortality rates among 27 EU countries. OBJECTIVES: We asked whether the 25(OH)D3 status in apparently healthy medication-free Slovaks deteriorates upon ageing, and in the presence of cardiometabolic risk factors. METHODS: We studied the impact of blood pressure, overweight/obesity, smoking, and physical activity on 25(OH)D3 levels determined using RIA method in 578 (5–81 years old) subjects. RESULTS: The average level of 25(OH)D3 was 36±17 ng/ml. A proportion of 15 % of participants were 25(OH)D3‑deficient (≤20 ng/ml), 26 % presented insufficient (20-to-30 ng/ml), and 59 % satisfactory (> 30 ng/ml) levels. Neither mean 25(OH)D3 levels, nor the prevalence of hypovitaminosis D showed age dependence. Physically active normotensive non-smokers presented the highest (41±19 ng/ml), and their smoking counterparts with elevated BP the lowest 25(OH)D3 levels (30±12 ng/ml). CONCLUSION: In apparently healthy medication-free Slovaks the prevalence of hypovitaminosis D is high. Vitamin D status does not deteriorate in course of healthy ageing. Physical activity, normotension, and non-smoking status are associated with favorable vitamin D status while low 25(OH)D3 levels are associated with multiple cardiometabolic risk factors. Further studies in subjects at high cardiovascular risk are needed to elucidate the potential association of hypovitaminosis D with high cardiovascular mortality in Slovak adults (Tab. 1, Fig. 4, Ref. 42). Keywords: vitamin D, blood pressure, smoking, physical activity, body mass index.